Set in 1962, six years after her celebrated “Wedding of the Century”, 'Grace of Monaco' tells of a year in the life of the 20th century’s most iconic and glamorous Princess - Grace Kelly – as she strived to reconcile her past and her present; yearning for a return to the big screen with her newfound role as a mother of two, monarch of a European principality and wife to Prince Rainier III. It was a crossroads for the cinematic idol. An American far from home, Grace contemplated a return to her celebrated status as a movie star, globally loved and adored, or whether to embrace her new identity. From the director of La Vie en Rose and featuring a captivating performance by Nicole Kidman ('The Hours', 'Moulin Rouge! '), Grace of Monaco is a real-life fairytale, a sweeping romance and a portrait of the greatest transformation Grace Kelly would ever undertake. The 'Grace Of Monaco' competition has now closed. Winners will be announced shortly. Competition opens at 6:30pm AEDT on Sunday 12th October 2014 and closes at 11:59pm AEDT on Sunday 19th October 2014. Three winners will be chosen at random on Monday 20th October 2014. To successfully win, entrants must fulfil the above entry conditions before the time the competition closes. Current members/followers are eligible to enter the competition. Only one entry per person. Only one winner per household. To be a valid winner, the entrant must not have won a prize from SWITCH within the last 28 days. Each winner will receive one Blu-ray copy of 'Grace Of Monaco'. By entering, you agree to receive occasional emails from SWITCH in the future. If you decide to unsubscribe from these updates, any further entries will not be applicable. Only Australian residents are eligible to enter. 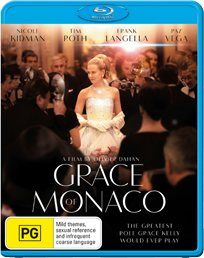 'Grace Of Monaco' is available on Blu-ray, Digital HD and DVD on Wednesday the 15th October 2014 from Entertainment One.